A glimpse of the future - wonderpaars jimdo page! It was Alex’s big weekend. She had just finished graduate school and received her Masters in Holistic Health Education. All of her family was in town to celebrate with her. What Alex didn’t know was that this was the weekend when all things seemed to line-up for me to propose to her. It was a plan months in the making. For almost 6 months I had been writing my thesis and feverishly squeezing in as many remaining requirements as I could so that I could graduate on Saturday. I presented my thesis on Thursday, walked across the stage on Saturday to receive my diploma and let my accomplishment be celebrated with a gathering of friends on Saturday night, when I all I really wanted to do was crawl into a dark cave and sleep for 2 months. I was emotionally, mentally and physically exhausted but I was done. I had a Master's degree. All that was left was Patrick's gift to me on Sunday morning and if I could make it through that, then on Monday I would allow myself to head to the nearest hot springs and simply re-charge. It was Sunday morning and I knew I just had to get on the plane. Not the best attitude for such a generous gift, but you have to understand my exhaustion. I was running on empty - and really had nothing left to give. But I could tell how important this was to Patrick and I had been so distracted since the beginning of the year, that I managed to get it together and simply go with the flow. It was one of the picture perfect days that you get in San Francisco and as we crested at the top of the hill of Divisadero that looks down onto the Bay, I think I started to feel the relief of my accomplishments and that I might actually let myself enjoy the day. We crossed the bridge and just as we reached the other side Patrick started to say something about understanding where I was in my life - not certain of the next steps, unclear of what to do now. He encouraged me to let the perspective of flight help - seeing the bigger picture and not getting so caught up in the little details. I should just see this beautiful place in which we live and perhaps I would be able to get a glimpse of the future. 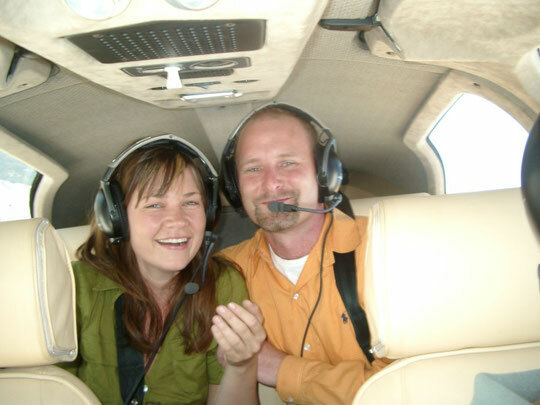 I took his words to heart, took in a deep breath and thought, "Actually I am really lucky to have a guy that would see a simple plane ride as a chance to gain some perspective and catch my breath." I sat deeper into my seat, smiled and let the last few months of stressful work behind me. A few minutes later we arrived at the air strip in Novato where the pilot was already waiting for us with the plane ready to go. (John Gambs, the father of my close friend Kate, was so kind to pilot this very important flight for me). Now, John was an accomplice of my plan from the beginning and we had previously strategized about the details. For one, we decided for both of us to sit in the back seats, so that I could actually pose the question. At the plane, John expertly explained to both of us that it would be better for “weight” reasons for us to sit in the back seat. Having been a CFO of a large financial institution, he was able to bring this across to us with a strong impression of authority - Alex didn't even think twice about it. Second, we decided that I should sit behind him. That way he and I could look out of the window from the same side and take a close look at the status of operations, performed by the ground crew below. We arrived at this teeny tiny airstrip and I saw this teeny tiny plane. Seeing Kate's dad helped to make me feel a bit more comfortable about this somewhat out-of-the-box gift and I listened attentively as he told me where to sit and why. I had no reason to question his directions. I still had no idea what was about to happen - absolutely no idea. 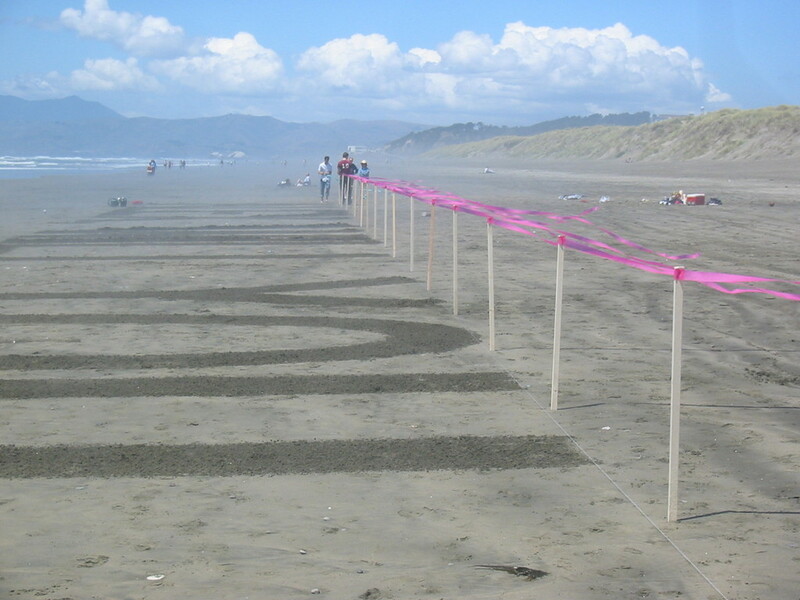 As we fastened our seat belts and got ready for take off, the “Ground Crew” got ready to execute the beach plan. One of the reasons why I chose this way of proposing is that I wanted to involve as many friends as possible. I loved the fact that without the help of friends I wouldn’t have been able to propose to my love Alex. So in a way, their help meant that they indeed supported the idea of us getting married, which was very important to me. Moreover, because it was Alex’s graduation weekend, her mother and both brothers were in town and became part of the ground crew. This made it all even more meaningful, for the life adventure Alex and I were about to embark on. Armed with rakes, water sprayers and a scaled print-out of my proposal message, the ground crew got to work. 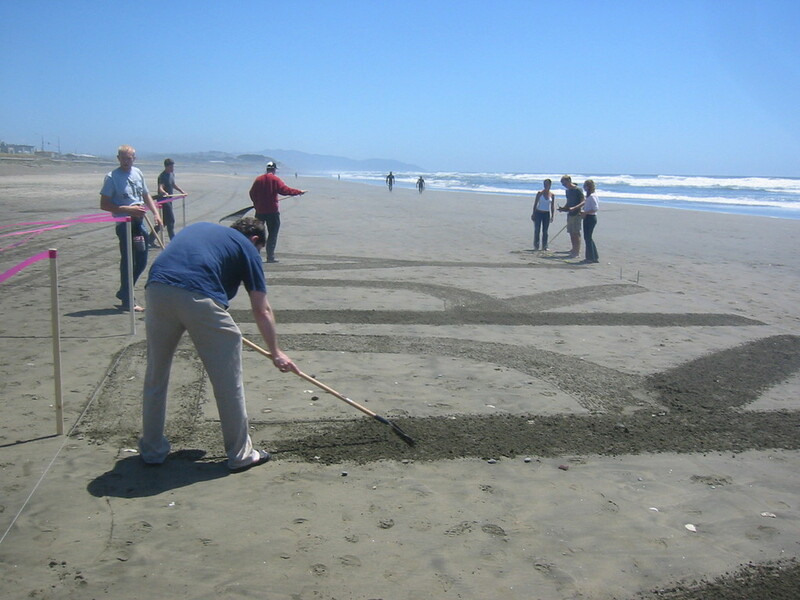 Led by Andrew Vik (insert Facebook link), assisted by Todd Latham and Andreas Amundin, they started raking the words into the sand of Ocean Beach. Andrew went through the pain of taking a printout of the message (in Arial font) on a letter sized paper and scaling it to the size of a football field. 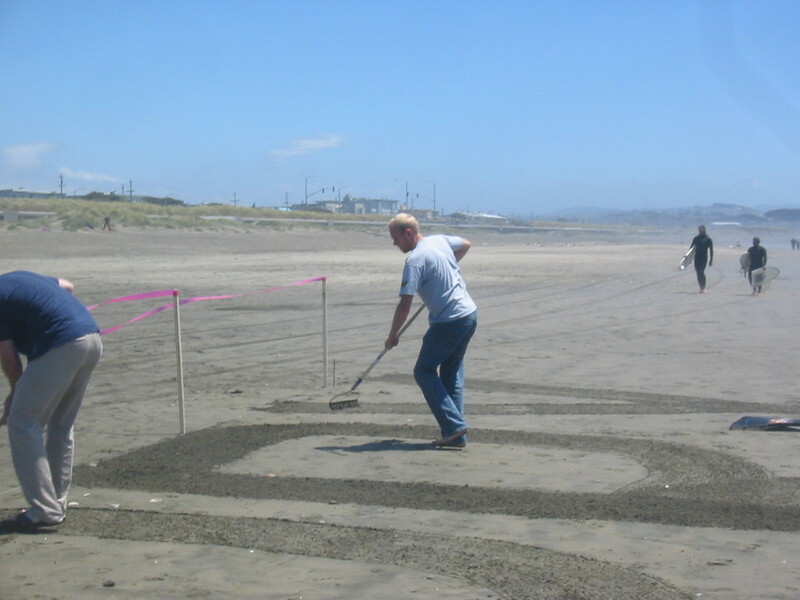 He did this so well that he actually was able to instruct the team exactly where to start raking and where to stop. 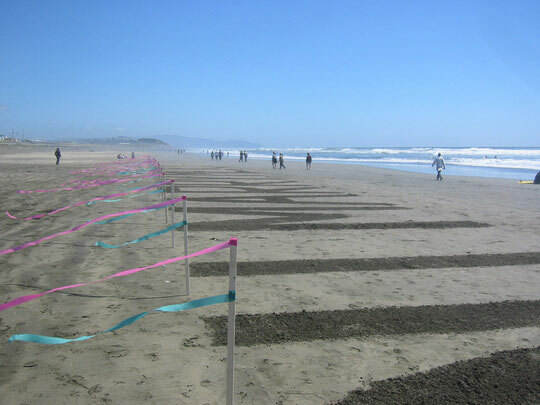 To keep the lines straight, they used lines connected to iron rods that were rammed into the sand. On the other side of the Golden Gate Bridge, Alex and I where climbing the skies. Our flight plan included a quick fly over Point Drake and Tamalais Bay, before we would turn South to fly past Ocean Beach. As the pilot turned the plane due South, I pulled out my phone and sent a pre-written SMS with the content “Arriving in 10”. We passed the Golden Gate Bridge and that was the time when I realized what kind of question I was about to ask. I had a serious moment of nervousness as we passed China and Baker Beach, but it got wiped away the moment we flew over Ocean Beach. 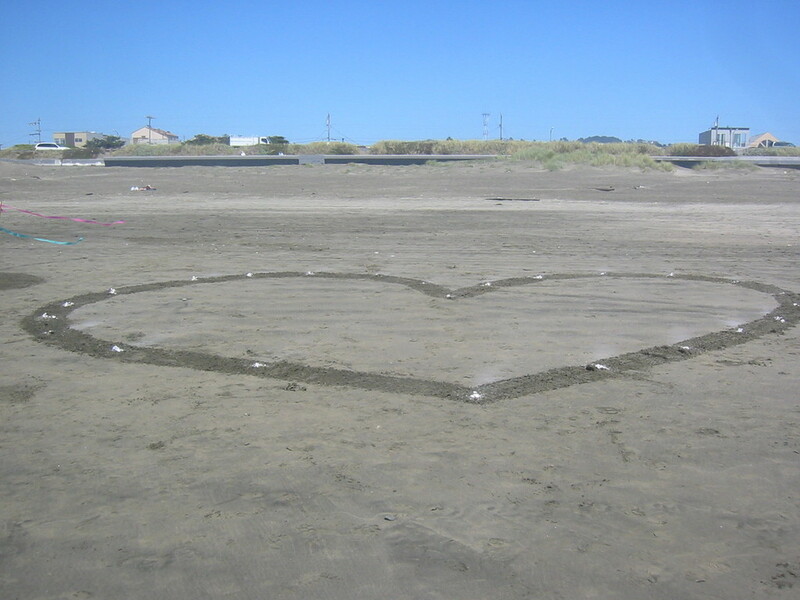 Down below I saw my message beautifully written into the smooth sand of Ocean Beach. It looked amazing, I was absolutely impressed on how well the ground crew performed. I could see the enormous letters and people (as small pecks) all around them. 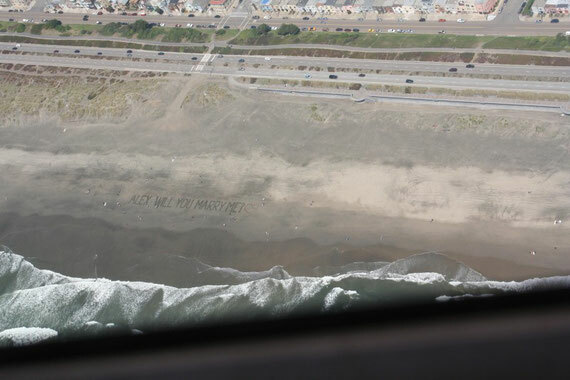 Remember, Alex was sitting on the other side of the plane and had a great view of the worlds largest water mass, the Pacific, but she could not yet see the message below. He was right - as we gained in altitude, I started to see everything so clearly. By everything I mean that I simply just started to see where we were and where I was in this greater scheme of life - I saw how much nature the city is surrounded by and how expansive the mighty Pacific is. I saw the city from a distance and realized that everything in fact, would be okay and that I was exactly where I was supposed to be. I saw that there was no other place that I wanted to live. I saw hope. I felt light and life for a moment felt effortless. I suppose this is why some people love to learn how to fly. We passed the Golden Gate Bridge and headed towards Ocean Beach. At one point Patrick pulled out his cell phone and I was so irritated that he would need to "play with his phone" while we were up here but I didn't even think about why he would be needing it. I let the thought go and just continued to enjoy the magical world that I was watching through my little oval window. Us flying by was the indication to get ready for the actual proposal fly by, so they went to work to light up the 20 flares that were poked into the heart shape at the end of the message. In the meantime we descended a little in height, and turned the plane around at the end of Ocean Beach. As we did so, John, as discussed, told Alex he was turning around to look at something he had seen on the beach. He believed it was a stranded whale. 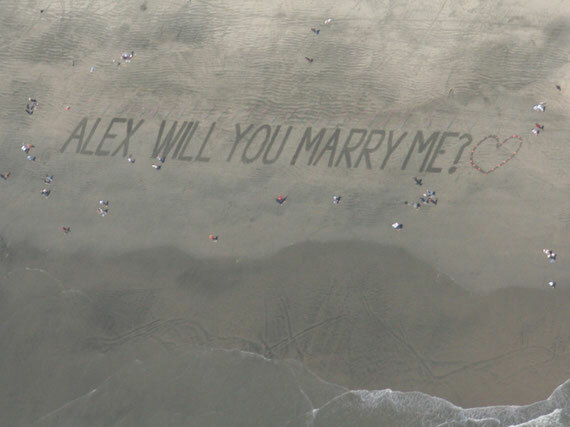 This was our best bet to keep Alex’s eyes glued to the beach, right there where the team had raked the proposal that was waiting to be read by her. We approached the sight and the text came into view. I am looking at Alex, nothing is happening. I keep on looking at her, while she is looking down. She moves her head down, closer to the beach, as if she is try to read something. Suddenly she jerks her head around to face me, but only for a split second before she performs a perfect double take, by looking at the beach again. More seconds go by. While Alex is looking down, I get ready to ask the most important question of my life. Finally, she turns back to me and I asked her in German if she would like to be my wife. (“Willst du meine Frau werden?”). Alex looks at me and answers: “But...But that’s not a whale!”. She looks down again, just to turn her head back to me. I am getting ever so slightly nervous and say: “Yes, I know, but that isn’t the answer to my question.” Alex, looks at me and says: “Yes, Yes, of course I would like to be your wife”. “Pheew” was what I was thinking initially, but that got replaced very fast with a tsunami of emotions and excitement. I was going to get to marry the love of my life. I was watching the horizon and somehow caught John saying something about a beached whale he had seen on Ocean Beach, and that we were turning around so that I in fact could see it too. Great, I thought, as visions of the mass whale beaching in Whale Rider whirled through my head - that is the absolutely last thing I want to see right now. Really a beached whale! I was so high on hope and possibility that the idea of a beached whale literally made me want to cry. But I kept my eyes glued to the sand below as John and Patrick became more convinced that there was something down below that I would not want to miss. Through the small oval window I watched the waves lap the sand below and smiled as I saw the moving dots that I knew where people but who from this height were barely distinguishable. I kept watching and then suddenly like the ticker tape at the bottom of the CNN screen I saw these prefect words etched into the sand. 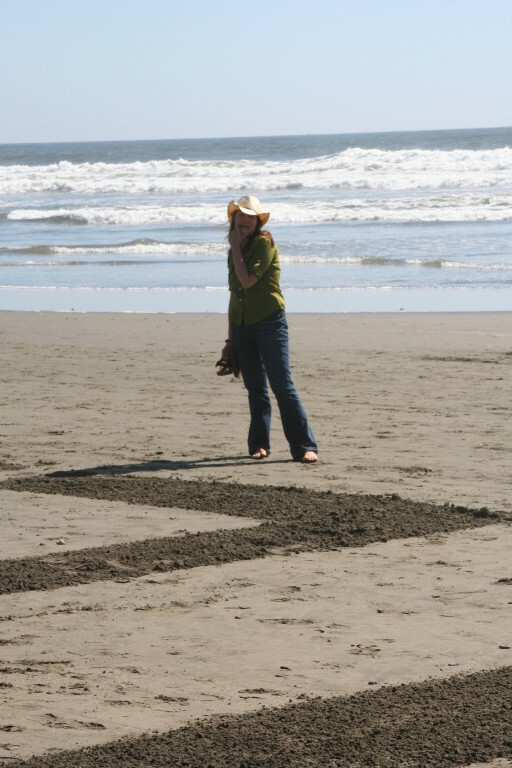 First a heart, then a question mark, then Alex...since we were coming from the south it read something like ?xelA, em yrram uoy lliw...and since I was still looking for a whale, I thought "Oh wow, someone named Alex is getting propoooseeeed.....oh, *@%^ my name is Alex!!!" And I froze, staring down at the words and I couldn't get myself to turn to my left, toward Patrick. But somehow I did and every cell is my body was electric and I think that I may have even stopped breathing. And he looked at me and with an uncertainty and nervousness that I have never before experienced from him, he asked me in German to be his wife. And then I think I looked back at the beach. And then back at him. And in all honestly, I replied, "But that is not a whale." He must have asked his very important question again and then at some point he pulled out a ring and I said yes, yes, yes and then simply waited for my heart to feel like it was not going to jump right out of my chest. In the meantime, the ground crew was waiting to here the news as well. John and I decided to do this really old school, just like the plane returning from a successful run in the First World War - the pilot made the wings tilt up and down, indicating a “She said “YES". 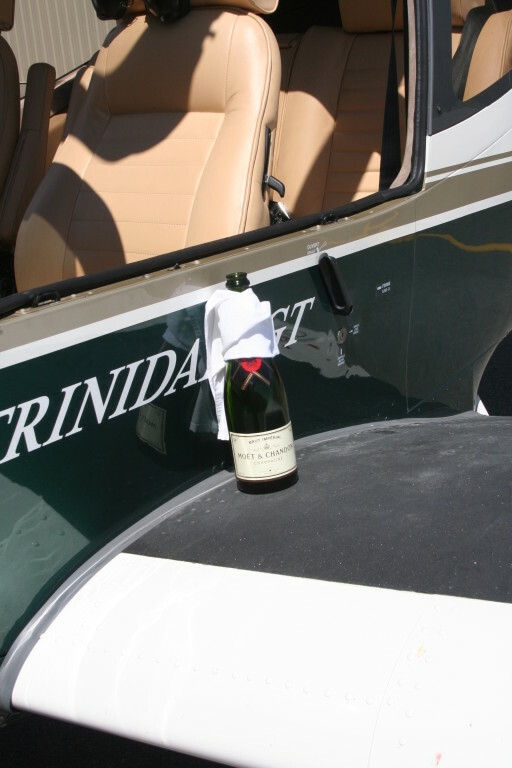 The ground crew responded by popping bottles of champagne, which we provided for them as part of the plan. What happened next is really unclear. I just remember wanting to feel the ground beneath my feet but we were cruising up over the Pacific and we had the whole ride back north. I don't remember what we talked about or what I said but I remember feeling like everything had just changed, everything. The remainder of the flight is all but blurry to me and it felt like we landed shortly afterwards. The moment we got out of the plane, John had already opened a bottle of champagne to celebrate with us. That was not part of the plan, and he had surprised even me with that. The ride back to the city was short, and of course the entire ground crew was waiting for us as a surprise for Alex in our apartment with more champagne. It was a big day for both of us, though I am not sure if I actually helped Alex feel less overwhelmed that day or not. Back on the ground, I could feel the earth beneath my feet but it was still spinning faster than I could hold on. It was all so surreal. Because if you can believe, I really had no idea. In the car driving back across the bridge, amidst excitement and joy, I started to piece together the last 6 months and could see how perhaps I had missed so many extremely obvious clues. 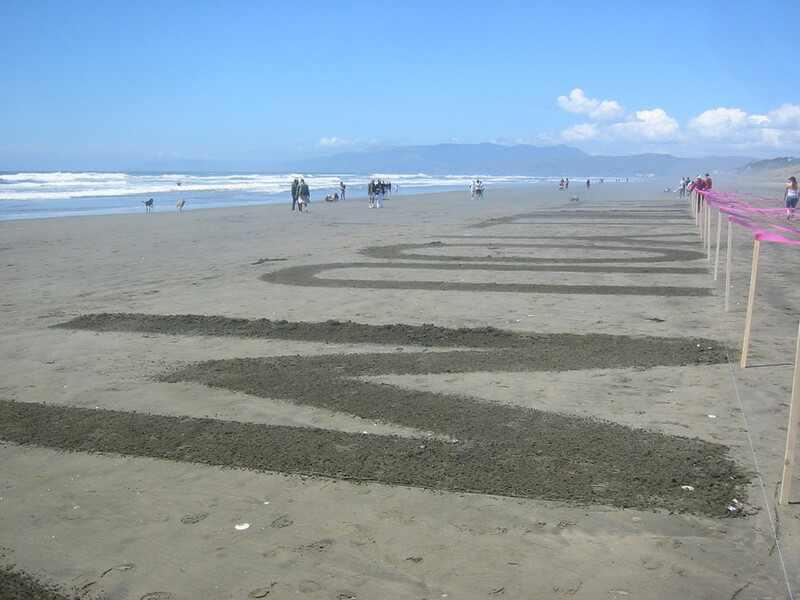 Before heading home we actually headed to Ocean Beach and walked straight to the ginormous letters that were still etched in the sand. I looked up into the sky where only a short time before we had been flying. A couple walked by and said something like, "Is this for you? Lucky girl." and I just remember looking at them with glassy, bewildered eyes. But how, who? I still had so many questions. 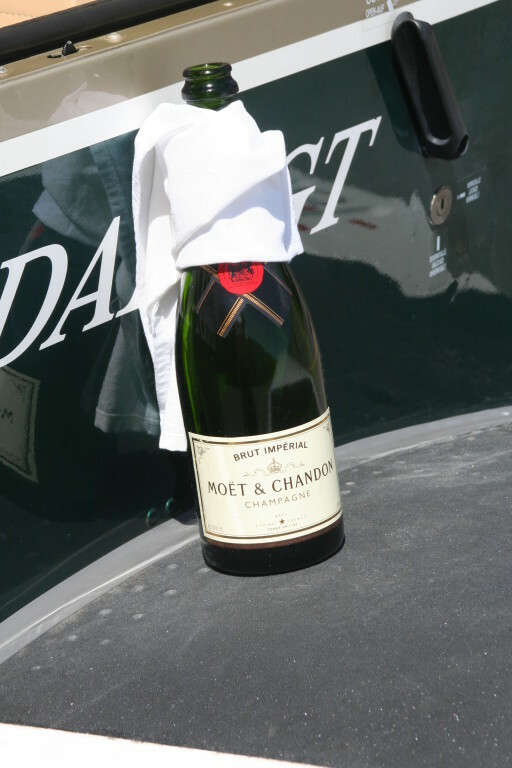 Upon returning home, as I opened the front door, I immediately realized why Patrick had asked me where the champagne glasses were the day before - somehow I knew that his whole Ground Crew was upstairs waiting to celebrate the happy news. I was so bewildered but it helped immensely to see the faces of my mom, brothers and dearest friends. And no, I did not come home that day any less overwhelmed than when I left but now in hindsight, I see that it happened all exactly the way it was supposed to.